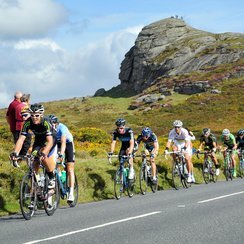 Britain's finest road cyclists will be racing through Devon. Starting in Sidmouth, they'll climb 3139m over 150km to Haytor. Stage Six of the Tour of Britain comes to Devon on Friday 9th September - here's what you need to know if you want to see them in action! These times are all subject to weather and race conditions. The Tour of Britain kicked off in 2004 and quickly became the country's largest free-to-watch live annual sporting event, attracting over a million spectators to the roadside each September. Many hundreds of thousands more will be watching via television and online around the world.